Andrew practices physical therapy at UW Health at the American Center and specializes in the treatment of a variety of orthopedic conditions. He uses a combination of exercise- and movement-based therapy, as well as hands-on techniques to treat people who have conditions affecting their neck, spine and upper and lower extremities. 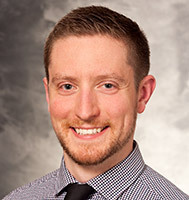 He is a member of the Wisconsin Physical Therapy Association and the American Physical Therapy Association, is licensed by the state of Wisconsin to practice physical therapy, and sees patients upon referral. Andrew holds a Bachelor of Science degree and a Doctor of Physical Therapy degree, both from the University of Wisconsin-Madison.